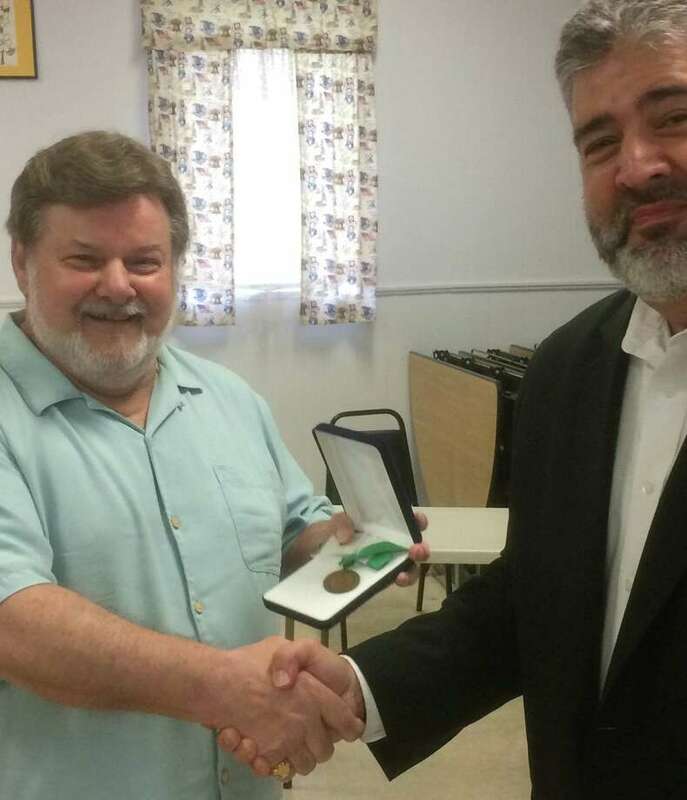 New Milford Mayor Pete Bass, right, presents Ed Funk with the New Milford medal, honoring him for his years of service, during a recent ceremony. New Milford resident Ed Funk was recently presented several veteran recognitions, honoring him for his years of service, during a special ceremony. He was given a Quilt of Valor by Susan Elliott of Sew Thankful Sewers of Avon Congregational Church, a New Milford Veterans Medal by New Milford Mayor Pete Bass, and a 50thy anniversary Vietnam medal and lapel pin by Jim Delancy of the New Milford VFW. Funk served in the United States Army from 1967-69, having served in Vietnam, working first as a company clerk and later a member of the infantry. While serving, he was caught in a firefight and although he had no training on the weapons he was expected to use, Funk defended himself and others. He was recognized for driving an ATV to cover his fellow soldiers. After returning to the states, Funk was a drill sergeant at Fork Polk, La., where he trained soldiers before they were deployed to Vietnam. He was awarded the Army Good Conduct, Vietnam Service, Vietnam Campaign award.